My freshman year of high school I was invited to a party at a senior’s house. (A SENIOR’s house!) It wasn’t one of those high school parties like you see portrayed in movies with kegs of beer and loud music and kids being out of control. This was a party where we dressed up in semi-formal wear and talked about MIT’s Morris computer virus and Benazir Bhutto’s election. I was one of only a handful of freshmen who had been invited and the only reason my parents let me go was because my parents knew the host’s parents. It was amazing and I felt so cool to be at a real party talking to upperclassmen. That is, I felt super cool until an hour into the party when things went horribly wrong. Okay, so “horribly” is hyperbolic, but at the time it felt like the BIGGEST social mistake of the century. While serving myself punch out of a bowl, I shattered the crystal ladle. It was the host’s mother’s family heirloom — and I had ruined it. Silence spread across the party and then for the entire rest of the night it was a thing. I was now the clumsy girl (who felt immensely guilty) who was not to be trusted near anything breakable. And it stayed a thing for the rest of the school year. “Want me to hold that book for you, Erin? Wouldn’t want you to break it!” In fact, I occasionally talk to the guy who threw that party, and it is still a thing. More than thirty years of history has been shared between the two of us, but breaking a ladle is my legacy. Swell. So, when I saw this week’s unitasker, my heart did a little spin. If only the senior had served the punch in one of these! My reputation would be unstained! The ladle would not be broken and I would not be known as the girl who breaks things! Actually, who am I kidding, I am ridiculously clumsy. 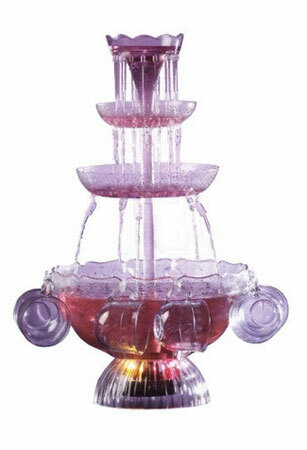 Had he used one of these monstrosities, I would have broken the whole thing and made an even bigger mess. The incident would have been similarly disastrous to the segment on Sesame Street with the uncoordinated baker who repeatedly falls down the stairs. I’d have been a complete outcast for all of high school instead of simply the clumsy girl. I’ll stick with the reputation I have. Heck, I just realized you can’t even use this device with punch that has rainbow sherbet in it — which we all know is the BEST kind of punch! Why even serve punch if it’s not rainbow sherbet punch?! ‘Tis a no-tasker after all! Do you inconvenience others when you arrive late? Do you actually put others’ lives at risk speeding to your next appointment? Jeri offers tips on how to overcome the bad habit of running late. For less that what you will spend in a year on parchment paper, you can buy two reusable Silpat silicone baking mats — and save space, too, in your pantry. This is how it feels to live my life: scattered, fragmented, and exhausting. I am always doing more than one thing at a time and feel I never do any one particularly well. I am always behind and always late, with one more thing and one more thing and one more thing to do before rushing out the door. Schulte is an award-winning journalist, and it shows in her book. Overwhelmed is filled with references to research in brain science, sociology, etc. and also with enlightening first-person interviews. It even has copious endnotes. But Schulte is an engaging writer, and the book never drags. Schulte spends a lot of time describing the cultural and structural issues that help lead to overwhelm — including jobs that expect long days in the office, the lack of high-quality affordable child care, and a society that smiles on busy-ness. (She interviews a scholar who has collected and studied thousands of holiday letters, where busy-ness and crazy schedules are ongoing themes.) But, Schulte also points out “bright spots” where organizations and cultures are moving in directions that help people live less overwhelmed lives. 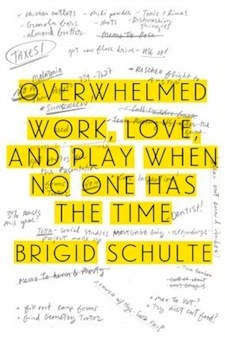 While many of Schulte’s anecdotes deal with mothers, she’s very clear that the issues of overwhelm applies to all. Fathers also get stressed about work time vs. family time. And “single people want lives, too,” as attorney Melvin White explained to her. While it’s mostly toward the end, Overwhelmed has many ideas about what others can do now, to help be less overwhelmed. This advice is based on Schulte’s research and what worked for her. She started getting to-do items out of her head and onto paper — a familiar idea to those who know David Allen’s Getting Things Done. She chose three focus areas, which come first as she plans her time; everything else goes under the category Peter Bregman calls “The Other 5 Percent,” because they should only get 5 percent of your time. To make sure that focus happens, her daily to-do list is now short enough to fit onto a standard size Post-it note. Working continuously, without breaks, is in fact a surefire way to produce subpar work … Pulsing — deactivating and reactivating the brain — actually makes it pay better attention. 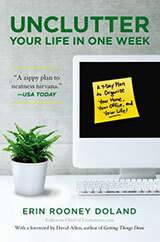 The book has an appendix entitled Do One Thing, which is an 8-page bullet list of things each of us can do to overcome the feeling of overwhelm — but it’s the one part of the book that’s a bit dull. Still, it’s a decent summary of the points made throughout the book, and a good reminder that there are indeed plenty of things we can do to feel less flustered. 1-2-3 Magic is a child discipline method that employs time outs for poor behavior. Per the method, the time-out is supposed to take place in the kid’s room if the discipline occurs at home. I guess some furniture designers don’t think an entire room is punishment enough, so they have invented a specific chair to put in a kid’s room just for time outs — the Boys Time-Out Chair. It’s Friday and I’m ready for the weekend. As a result, I’m putting the brainy content on hold until Monday and let you explore some links. Have a great and uncluttered weekend, everyone! And now for the toot-our-own-horn segment of this list … last week I was featured in an article on The Huffington Post about how to better organize your mornings: “These Ridiculously Simple Morning Hacks Will Help Set You Up For The Day.” If you struggle with getting out of the house on time, the article contains some helpful hints for improvement. 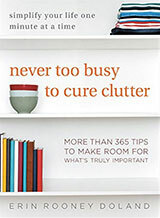 We were featured in two articles in January’s issue of Family Circle that were converted to slideshows for their website: “Declutter Your Home in 31 Days” and “A Place for Everything: Easy Home Storage.” If you like Pinterest, these pieces might speak to you. Have you read any interesting and/or inspiring uncluttering and organizing articles lately? If so, please feel welcome to share them in the comments. At least once a year I do a clean-up of my file cabinets, and I just finished my latest round. Every time I do this, I’m amazed at the stuff I have kept that I really don’t need. I worked for Hewlett-Packard Company for many years; the founders, Bill Hewlett and Dave Packard, are still two of the people I admire most. I had a lot of information about them, and I narrowed it down to the few things that were especially meaningful to me. I scanned many of those, and got rid of the paper. I really enjoy the Miss Manners columns, and I’d clipped a number of them. The ones I still found useful — maybe a quarter of the one I had saved — got scanned, and all the clippings were recycled. I’m talking here about general information, not my personal health information. Even though I’d discarded much of this before because medical information changes so quickly and so much is available online, I still found a few papers I had kept for no good reason. I really don’t need the newsletter from a local hospital, from 2004, talking about mini-incision hip replacement! Why in the world did I keep printouts of song lyrics? I’m not even talking about the nice inserts from old LPs, just computer printouts. I had kept tips on good writing, which included things I’ve long ago absorbed. So, out went the April 1995 article on using quotes in articles. In summary, I’m getting rid of everything in my filing cabinet that is out of date, no longer interesting or useful, or readily replaced with online information. What have you cleared out of your file cabinet lately? Please share your discoveries in the comments. They look precious, don’t they? They are all snuggled up, ready for a night out under the stars. Darling little spuds! Snuggly wuggly wittle ‘taters! What’s that? The Potato Express isn’t a sleeping bag for potatoes? You say they’re a steam bag for cooking potatoes in the microwave? Way to rain on my parade, especially since all you need to steam potatoes in the microwave is a plate and bowl. Put plate in microwave, poke a few holes in a potato with a fork, set potato on plate, rest inverted bowl over potato, close microwave door, run microwave on high for necessary time (in our current microwave this is five minutes, in our previous microwave it was seven), open microwave door, using oven mitts remove the bowl from over the potato, take cooked potato on plate out of microwave, and eat potato. 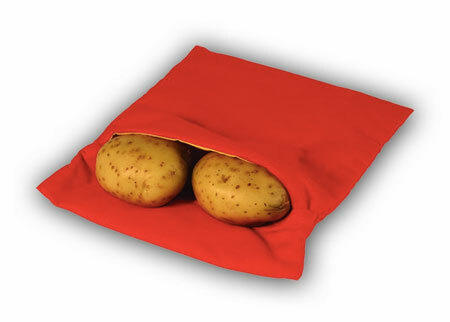 But, as a sleeping bag for potatoes, it sure looks cuddly! Deb discusses four products that can help you stay organized at home that she discovered while at the 2013 National Association of Professional Organizers’ annual conference. Dave describes four systems that help categorize and prioritize items on your to-do list so you can be more productive. Spring break is taking place this week and my family and I are spending it on the road. By the time you read this, we will have already traveled from Massachusetts to Pennsylvania. It’s a drive I’ve done many times over the past 20 years. And, since our oldest is 11 years old, we’ve been taking kids along for the trip for more than a decade. All this driving has taught me a thing or two about getting organized for road trips. The following are lessons I’ve learned on how to manage lengthy road trips with the kids. I sound like my dad here, but make sure the car is ready to go before you leave. I like to make sure the oil has recently been changed, the wipers are in good condition, and so on. I keep a working set of jumper cables in the back of the car, plus a first aid kit, some blankets, a pocket knife, and a flashlight. I’ve meant to get one of these emergency car kits for a while now, but I keep putting it off. It’s a good investment and I ought to do it. The next step is packing and gassing up, which I always do the night before we leave. As for packing, there are types of cargo and each has its location in the car. This is the stuff we don’t need during the journey but will need at our destination — clothes, toiletries, stuffed animals, night lights. These items go in what we used to call “the way back,” but what you likely call the bottom of the trunk. A few years ago we borrowed a portable DVD player for the kids. Now, iPads fill this role for entertaining them. A fully charged iPad will keep the kids occupied for quite a while. Our rule for electronics in the car: the journey must be more than three hours to warrant iPad use. A jaunt to the grocery store does not count. Headphones are also required. Books, drawing paper, pencils, and portable toys are also packed in the back seat. All of this stuff goes into a sturdy Tupperware bin that fits between the kids’ seats. This way, the kids can retrieve/replace what they want on their own. 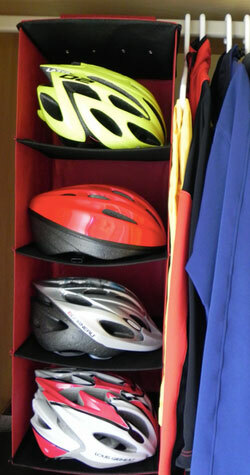 If you don’t want to use a bin, an over-the-seat organizer might work for your needs. We also keep small pillows within reach of the kids, should they want to take a nap. Road food is often expensive (for what it is) and almost never healthy. My wife always packs some healthier snacks and keeps that in a small cooler up front with us. She can dispense snacks and drinks as needed. And, don’t forget a bin for trash. A few more quick tips: Magazine holders fit beautifully between mini van seats and hold books so that they’re easy to see. If your kids are older, let them pack and be responsible for their own activity bag. People who travel regularly with kids might benefit from creating a travel go-bag, like Jacki wrote about yesterday. At the very least, keep a list of things to pack in the backseat with the kids so you don’t forget anything and also so you can note afterward what items were a hit and which ones should be left at home next time. Baby wipes and paper towels are a great idea, as somebody is likely going to spill something or need to clean their hands. Finally, if your kids are younger like mine, decide on assigned seating ahead of time. No switching. No upgrading. No changing. There are many things I’ve learned about organizing because my husband is in the military. Soldiers keep certain equipment and clothing packed in their rucksacks at all times. If they ever have to “bug-out” (called to duty in an emergency) they just grab their rucksacks and go. In these circumstances, it takes them five minutes to leave the house. Soldiers are provided with a list of what to have in their rucksacks at all times so they have everything they need. I’ve implemented this system in our household for non-military purposes. When my children were babies, I had a list of items that I always needed in the diaper bag. Every time we arrived at home after being out, I restocked the bag with diapers, wipes, and creams. Then, I quickly looked down the list before heading out the door the next time to ensure I had everything in the bag. As my children have grown older and are participating in activities, we’ve created a “go-bag” for each activity. Their items for that activity remain always in that bag unless being used or cleaned. We prepared a list of items for the bag, and even used pictures of the items to help them when they were younger. The list was printed on an index card and laminated. On the reverse side of the index card was emergency contact information (child’s name, parent’s name and phone number, allergy information, etc.). The card was kept in a pocket of the go-bag or sometimes, attached to one of the zippers on the outside of the bag. 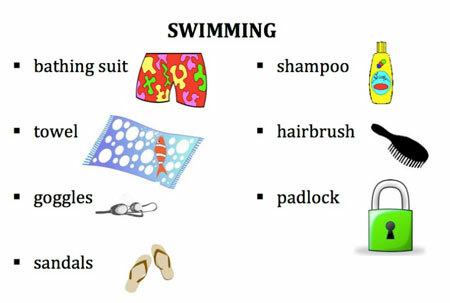 On arrival home from swimming lessons, the swimsuit and towel would be washed, shampoo refilled if necessary and the bag stowed on its dedicated hook in the hallway. Once laundered, the swimsuit and towel were returned to the bag. This system works with sports gear and arts and craft supplies – and even your briefcase for work! We continue to have a number of “go-bags” hanging in our entryway and I find that being able to get out of the house quickly with all of the necessary equipment is worth it. Warning: This week’s product manufacturer states in all of their marketing materials that their plastic device “will blow your mind with its simplicity and effectiveness!” So if your mind blows out of your head, we want you to know that we are not liable but that we will miss your readership. YOU’VE BEEN WARNED! Dave explores strategies and apps that ensure he can get his work done when it needs to get done — and let him sleep soundly at night. The NuForce uDAC gives you affordable high-end computer audio in a compact and simple package.